The group play in many different formats, and are able to perform as a full company including dancers, musicians and percussionists, down to a solo dancer, providing authentic high quality live performances for festivals, theatres, weddings, parties and corporate events. In the last few years Al-Andar have played many shows throughout Ireland, Venues include: National Concert Hall (Dublin); Town Hall Theatre, Roisin Dubh and the Black Box (Galway); Siamsa Theatre (Tralee); Linnen Hall Theatre and Markree Castle (Sligo); Glor (Ennis). Fatima Lucia, from Cadiz (Spain), is the leader and director of 'Al Andar', a team of artists dedicated to conveying the unique sensitivity and passion of this tradition. 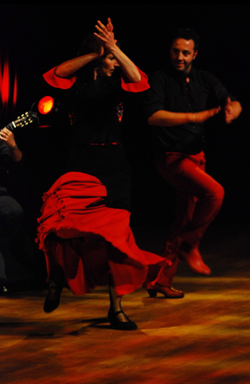 Al-Andar performs Flamenco in its purest form . To discuss your event please telephone or email us.